We specialise in teaching all levels of English to our students. We tailor make all of our classes and programs just for you so they suit your learning needs from beginner level up to Business and Professional. 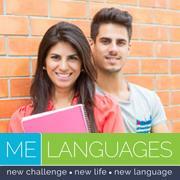 Your studies with us at ME Languages will be in comfortable surroundings at our intimate school based in North London. We have two cosy classrooms which make for the perfect learning environment, with a range of facilities that can be used here at the school. We offer accommodation and tour packages for our international students which are of the highest standards to help with your move to London for your chosen study period to make it easier for you. We have been teaching for more than 20 years at ME Languages and help people reach their desired goals when learning a new language. In 2006 we opened our first school ME Languages in North London. We have just expanded our classrooms at ME Languages and completed our refurbishment which has allowed for larger classes to focus on our new ‘Business and Professional’ courses. We are based on BrecknockRoad in North London which is a short bus ride or walk from Camden Town, Camden Road, Kentish Town and Tufnell Park stations.We specialise in teaching English of all levels to our students ranging from ages upwards of sixteen years old. We believe that for our students Price, Value for money, Quality, Time, Good Reputation and Professionalism are all very important factors.This is why we tailor make all classes and programs just for you so that they suit your learning needs from beginner level. No matter how difficult things seem to be, no matter how unachievable, with willpower and determination at ME Languages all your learning dreams can come true. I found the course suitable for what I was looking for and wouldn't hesitate to use the school again for a future course. The learning process was very easy and also the method used by the school. Highly recommended. I had the best time during my course and found it to be very useful. I will be starting another course with the school after Christmas and am really looking forward to it. My General English course with ME Languages was fantastic and I really enjoyed my time there in such a friendly atmosphere. I studied last year with ME Languages and completed a General English course to help with my job. I found it very helpful and the tutor made it relevant to my job.. I would definitely do another course there. I studied with ME Languages over the summer. I had a great time during my course and found everyone at ME Languages very helpful, friendly and knowledgeable. I did a Business and Professional English Course at ME Languages to improve my language skills and help me feel more confident at my job. ME Languages played a significant part in this process. The English tutor was really good and tailored the course to my needs. very nice, friendly and welcoming environment. I have had such an amazing time here. The teachers are friendly and you always go away having learnt something new and wanting to learn some more. I highly recommend ME languages! Great beginners course in General English !!! Studied English language in more depth to be able to relocate and gain work experience in London. Upon finishing my short course I gained a job working in the city!!! Great atmosphere, amazing tuition and fantastic learning environment. Would highly recommend ME LANGUAGES !! !